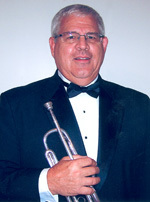 Dave Leapley taught instrumental music for 30 years in public schools in Ohio and has taught trumpet to students at all levels for over 35 years. A former member of the Springfield Symphony Orchestra, he has performed with the Columbus Symphony and various dance bands and combos in the Dayton-Springfield area. Dave is a member of the Ohio Valley British Brass Band and is the director of the Greene County Adult Concert Band. He holds a Bachelor of Music degree from Capital University and a master’s degree from The Ohio State University. Dave has studied with Ray Eubanks, Richard Suddendorf, Carmine Caruso, and Lowell “Bud” Arthur. Dave has also studied with Bert Truax, a former member of the Dallas and Philadelphia orchestras and a student of James Stamp. served as a district president and contest chairperson for the Ohio Music Education Association. Dave currently teaches trumpet at Wittenberg University.